Please note that this article applies to a very early production run of the FPX7, and that almost all of our criticisms have been addressed in current production models. Fluid Audio kindly sent us a later set for evaluation, and you can can read our very positive review update here. Below follows the original review, for posterity. Fluid Audio’s decision to use a ribbon tweeter in a dual-concentric speaker is an unusual one. We find out how it works in practice. Just as with London buses (at least as the cliché would have it), you wait an age to review a dual-concentric monitor, and then two come along in quick succession. My last nearfield monitor review was the Pioneer RM-07, with its KEF-inspired, dual-coincident compound driver; and now, I have a pair of Fluid FPX7s, with their intriguing dual-concentric ribbon HF driver, to examine. So perhaps, just this once, in denial of my natural instinct to head off on some discursive tangent, I’ll just begin with a bit of background and simple description. Fluid Audio are the brainchild of American speaker designer Kevin Zucarro, who, following a career that included spells with JBL, Cerwin-Vega and latterly Avid (where he was responsible for the M-Audio monitoring products), struck out on his own in 2011 to create Fluid. The company are primarily US-based, with manufacturing performed in the Far East. The Fluid product portfolio majors on entry-level desktop and nearfield active monitors, with the FPX7 sitting at the top of the range, although still at a price that I’d consider to be on the lower rungs of the professional monitoring ladder. In terms of size and proportion, the FPX7 breaks little new ground for nearfield monitors and it fits very comfortably on the wall brackets either side of my workstation. It feels a little insubstantial when lifted, and although its curved side panels will in theory be more rigid and less prone to resonance than similarly proportioned flat panels, tapping them does result in a slightly hollow ‘boing’ rather than the dull thud of something completely inert. Having said that, the FPX7 is, of course, far from alone in having a wood-panel-based enclosure that’s not entirely free of resonance. The front panel of the FPX7 is visually dominated by its compound driver, especially the ribbon high-frequency element which protrudes forwards somewhat and displays, to my eyes, a slightly ’60s sci-fi look — Dalek mix engineers will feel right at home. The LF/MF element of the compound driver comprises an apparently conventional 180mm paper/composite diaphragm diver. Around the compound driver, and covering the bulk of the front-panel real estate, is a faux-aluminium, brushed-silver plastic panel that also forms the mouth of the letterbox reflex port and provides trim for the cleverly illuminated Fluid logo and volume fader. The plastic panel, to my way of thinking, ought also to have provided scope for some generous flaring on the reflex port, but, save for a small radius, the opportunity was missed. Maybe I’m missing something, but I don’t really see the point of the front-panel gain fader fitted to the FPX7. It seems to me that adjusting the gain on active monitors ought to be a ‘set-and-forget’ exercise, with volume control subsequently carried out from the DAW, interface or monitor controller. I can’t imagine many scenarios in which I’d need, or want, to reach up to each monitor in turn and slide a fader. I suspect the argument for the fader is founded more on its visual appeal than its useful function and, as such, I’m afraid it has little traction with me. I’d really much rather be won over by classy electro-acoustics. At least the fader has detents, so that it’s no problem to set each monitor to the same gain level. 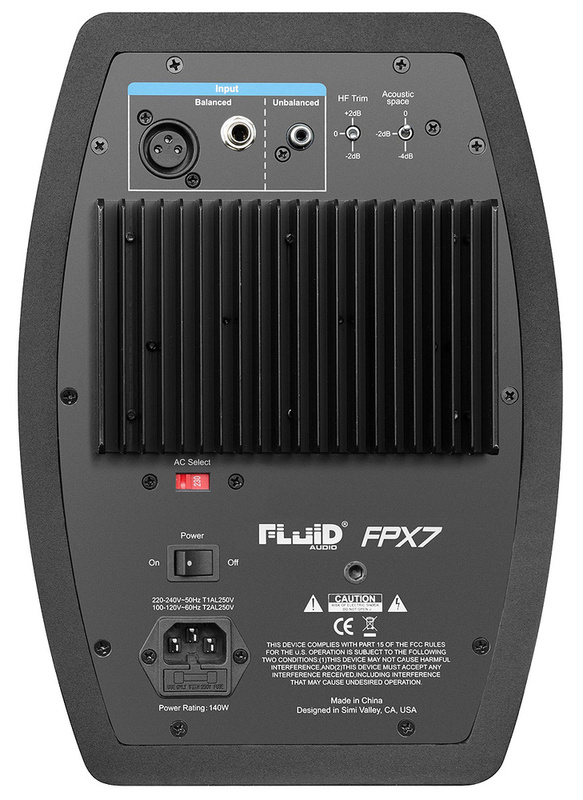 Around the back of the FPX7, a connection panel provides a mains socket and power switch along with balanced XLR, balanced jack and unbalanced phono inputs. There are no digital input options. The rear panel is also home to a heatsink for the FPX7’s internal amplification. Said amplification is conventional Class-AB, specified at 90 Watts for LF and 50 Watts for HF: easily enough for the FPX7s to play at high volumes without obvious strain. The crossover frequency is set at a relatively high 3.5kHz, which perhaps reflects the typically somewhat delicate nature of ribbon drivers. The published FPX7 information intriguingly describes the crossover as ‘DSP controlled’, from which I can only assume that there’s analogue-to-digital and digital-to-analogue conversion implemented within the signal chain. Also on the rear panel are a couple of switches that provide high-frequency and low-frequency EQ options. The HF options are ±2dB either side of the ‘flat’ option. There’s no HF EQ frequency stated in the FPX7 specification, and a quick check with with a FuzzMeasure frequency-response measurement suggests that the EQ switch simply changes the gain of the high-frequency amp, so the 2dB cut or boost operates from below 3kHz upwards. Over such a wide bandwidth, that 4dB range will result in a significant change in tonal balance. The LF EQ switch, which provides ‘flat’, -2dB and -4dB options at 200Hz, is actually labelled ‘Acoustic Space’, which perhaps could do with a little explanation. When an acoustician or speaker designer refers to ‘acoustic space’ they are describing the space that an acoustic source, such as a speaker, radiates into, in terms of any nearby reflective boundaries. A speaker, outside in the open air, perched on top of a really high stand, is effectively radiating into an acoustic space with no boundaries: a spherical space (technically described as 4π steradians). If we were to remove the speaker from its high stand and place it on the ground, we would have introduced a single boundary and halved the ‘size’ of the space, making it hemispherical (2π). Now, if you imagine a sound level meter measuring the output of the speaker, first radiating into the 4π space and then into the 2π space, the output in the latter case will be twice as loud, because all the sound energy that was radiated downwards in the 4π space will be reflected back upwards in the 2π space. That ‘twice as loud’ will be displayed on the SPL meter as a 6dB increase in level. If we add a further boundary, say a wall behind the speaker so it’s now in a corner, the acoustic space will have halved again, and the sound level meter will show another 6dB rise. If we now consider the rather different case of a speaker, such as the FPX7, in a conventional listening environment, the situation in terms of the analysis of acoustic space is rather more complicated. The complication arises because, firstly, unless the room is very large, almost regardless of how far away the speaker is, all the room boundaries come into play simultaneously to some extent. Secondly, because speaker dispersion typically varies with frequency, from predominantly omnidirectional at low frequencies to relatively directional at high frequencies, the results of reflected energy from room boundaries are much more pronounced at LF than at HF (one reason why ‘room problems’ are more often associated with bass than treble). So, to imagine that it’s feasible with the FPX7’s -2dB or -4dB shelf at 200Hz to simply correct for the effect of different acoustic spaces in a typical listening environment is a little optimistic. Having said that, however, it’s true that as you move a monitor closer to room boundaries its tonal balance will change, with closer boundaries almost always resulting in more low-mids and bass, so the facility to adjust the level in that frequency band is often useful — but it’s not true compensation for a different acoustic space. Low-frequency EQ options are, of course, not unusual on active monitors; but concentrically mounted ribbon high-frequency drivers are, and the FPX7 is one of only a few similarly equipped speakers. I wrote quite extensively about dual-concentric compound drivers in my recent review of the Pioneer RM-07 (www.soundonsound.com/reviews/pioneer-rm-07), so rather than fully reprise that material here, I’ll just repeat the vitals. Dual-concentric compound drivers primarily offer a couple of significant advantages over conventional displaced drivers. Firstly, the common centre location of two drivers should mean that the dispersion through the crossover region changes much less with different listening positions, and without the horizontal/vertical asymmetry of conventional driver arrangements. Secondly, the discontinuity that occurs when the a narrow-dispersion LF/MF driver hands over to a wide-dispersion HF driver should be reduced. However, engineering a compound driver without other compromises being introduced to overwhelm those fundamental advantages is not easy. In this respect, the least compromised dual-concentric driver is probably the KEF style, where a conventional HF driver is made compact enough to be located right at the apex of the LF/MF diaphragm. Viable high-frequency ribbon drivers, however, tend to be anything but compact, so in choosing to construct a dual-concentric driver around one, Fluid Audio have raised themselves a few issues. Perhaps the success, or otherwise, of the FPX7 partly comes down to how well those issues have been dealt with. The physical bulk of the ribbon HF driver element employed in the FPX7 means that it can’t be buried down at the apex of the LF/MF diaphragm, and can only be hung out in front. Ribbon HF drivers with adequate bandwidth and power handling just don’t come small enough to go anywhere else, so it’s not as if there was much choice. The problem this brings, however, is the obstruction of the LF/MF driver as frequency rises and the wavelength approaches the diameter of the ribbon unit. The body of the ribbon unit on the FPX7 is around 7.5cm in diameter, which, in terms of wavelength, equates to a frequency of around 4.6kHz, but the effect of the ribbon driver body may well be apparent at frequencies as much as an octave below that. Diagram 1 illustrates the FPX7’s on-axis frequency response from 300Hz upwards, showing a suspicious discontinuity at around 2.6kHz. Such a discontinuity is not really typically of the type of LF/MF driver used in the FPX7, so I suspect it may well be the result of the obstruction caused by the body of the ribbon driver (the smaller, 1.1kHz feature on the other hand could well be inherent to the LF/MF driver). Of course, it’s difficult to say if such a response discontinuity will be specifically audible, but there’s little doubt it will contribute towards the overall character of the FPX7. The Diagram 1 frequency response curve of the FPX7 illustrates another characteristic that will have an influence over its subjective character: a raised output above 10kHz or so (Diagram 1 also shows the -2dB HF EQ settings). Such a deviation from the supposed ideal ‘flat’ response might at first glance seem a deal-breaker — however, making assumptions about the likely sound of a monitor based on a single frequency response curve is usually unwise. Diagram 2 shows a comparison of the FPX7’s on-axis and 20-degree off-axis responses. The sound we actually hear from any monitor is a composite of the direct and reflected sound, so the detail of the monitor’s dispersion is as significant as any single response curve. This phenomenon is revealed a little by Diagram 2, which shows a comparison of the FPX7’s on-axis and 20-degree off-axis responses. The raised HF level on the axial response has already fallen significantly at 20 degrees off axis, so the excess energy is only apparent over a relatively narrow spread of forward angles. However, a second phenomenon becomes apparent: the narrowing dispersion of the top end of the bass/mid driver, combined with the FPX7’s relatively high crossover frequency, means that a significant depression develops in the response of the system between approximately 2kHz and 6kHz. This kind of off-axis discontinuity is the sort of characteristic that one would hope a dual-concentric compound driver would not suffer from. So, based on a few measurements, it looks perhaps as if the success of Fluid Audio’s decision to develop a dual-concentric ribbon HF driver is up for debate. Firstly, the physical obstruction of the ribbon driver appears to disturb the response of the LF/MF driver. And secondly, rather than showing the consistency that would be hoped of a dual-concentric design, the FPX7’s upper mid-range dispersion appears to narrow quite significantly. But of course, measurement is one thing, and listening is often quite another. Initial impressions were of a bright tonal balance but also of genuinely revealing and clean high frequencies. I pretty quickly decided to select the -2dB HF EQ option, and would have preferred even more HF attenuation, but, even balanced on the prominent side of neutral, the FPX7 ribbon driver is a great-sounding unit. Despite the fundamental quality of the driver, however, I’d still be concerned that its emphasis at the very top end of the band, and the enhanced ‘air’ and extreme HF detail that results, could leave mixes that transfer sounding a little dull. It’s perhaps a shame that the HF EQ option on the FPX7 isn’t a bit more selective, because a quick experiment with leaving the monitor EQ flat while inserting a -4dB shelf at 8kHz using a Pro Tools plug-in resulted, to my ears, in a more neutral overall balance while still allowing the quality of the ribbon driver to shine through. Another experiment: listening off-axis (ie. with the monitors angled inwards only slightly) tamed the HF excess, but only at the expense of the upper mid-range becoming a little recessed. It turns out that in the case of the FPX7, a couple of frequency-response measurements do reflect the subjective experience! At the other end of the band, the low-frequency bandwidth extension is relatively restrained, so it appears that the reflex loading and port are not being overworked, which is a good thing in my book. I quickly settled on using the maximum attenuation offered by the Acoustic Space switch in my listening environment, but I was never entirely comfortable with the character of the bass, finding it subjectively a little ‘lazy’ although by no means disastrously so. The FPX7’s bass performance will win no awards, but in the context of entry-level nearfield monitoring it is perfectly competitive. 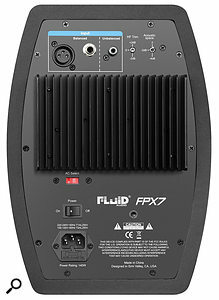 Complementing the revealing, detailed nature of the FPX7’s high frequencies, its mid-range performance demonstrates some similarly attractive and useful qualities. It has an explicit and revealing quality that can provide good insight into tonal character and how well a mix jigsaw fits together. Despite my concerns about the FPX7’s slightly live-sounding cabinet construction, there’s little sign of the low-mid ‘bloom’ that’s typical of enclosure panels playing along with the music. The mid range does, however, display a little raggedness and hint of nasal coloration towards the top end of the band; but on the whole, in a monitoring context, it’s an eminently workable sound. Stereo imagery is well focused too, but perhaps lacking a little of the depth perspective that really classy monitors can provide. Taking a suitably on-trend holistic view, with the one caveat of its slightly over-emphasised high-frequency balance, the Fluid Audio FPX7 is a perfectly viable entry-level nearfield monitor. However, at the same time, I return to wondering whether the concept of a dual-concentric ribbon driver is a good one. Part of me would be keen to hear that great-sounding ribbon HF driver used in a conventional configuration. Of course, however, mine are just one pair of ears, and other ears may hear things differently, so if you’re considering nearfield monitors at around the FPX7’s price, its mid- and high-frequency qualities are certainly seductive — quite possibly enough for its idiosyncrasies to become unimportant. 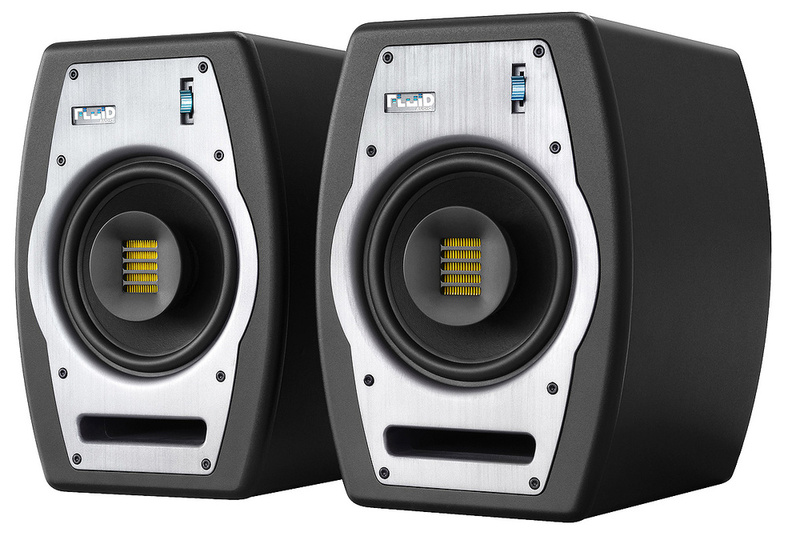 The world isn’t short on nearfield monitors around the price of the FPX7. Try models from Dynaudio, Genelec, Adam, Pioneer (the RM series), Focal, Eve, PreSonus, et al. Detailed, honest and explicit mid- and high-frequency performance. Workable bass that doesn’t try too hard. Expected benefits of dual-concentric design not entirely apparent. The competition is very tough but if you can live with, or perhaps even embrace, its idiosyncrasies, there’s quite a bit to like about the FPX7. £749 per pair including VAT.